Summer appeared happened so quickly that you may not be quite prepared for fun in the sun. Indeed, despite an increasing awareness of the sun's risks, rates of melanoma -- the deadliest skin cancer -- have tripled over the past 35 years. I'm not a doctor, but I think that with such a pronounced risk, we need to be smart and protect our skin from harmful UV rays. However, not all sunscreens are created equally. If you're anything like me, the re-emergence of the glorious sunshine after an extended winter has you dreaming of time at the beach and rollerblading under the open sky. It's as though we went straight from winter right into summer! It happened so quickly that you may not be quite prepared for fun in the sun. Indeed, despite an increasing awareness of the sun's risks, rates of melanoma -- the deadliest skin cancer -- have tripled over the past 35 years. I'm not a doctor, but I think that with such a pronounced risk, we need to be smart and protect our skin from harmful UV rays. However, not all sunscreens are created equally. If you're like so many others I know, you're probably concerned about things like avoiding products that are tested on animals or that contain potentially harmful ingredients, but uncertain where to start. Unlike chemical sunscreens, which use chemicals to react with the skin to protect against sun damage, barrier sunscreens form a physical barrier to block harmful UVA and UVB rays. Physical barrier sunscreen starts working the minute they're applied to your skin. These more natural sunscreens also tend to be made by product makers that do not test on animals, which is always a good thing for our furry friends. They even have a lighter load on the environment. Before you choose your next bottle of sunscreen, here are a few ingredients that you should know about. Conventional sunscreens use specific chemicals that absorb UV light to prevent burning. Unlike physical sunscreens, they can be absorbed into the skin. Environmental Working Group warns consumers to avoid products with oxybenzone and retinyl palmitate. Oxybenzone is found in the majority of chemical sunscreens, and it can penetrate the skin, cause allergic skin reactions and may disrupt hormones. Even at low levels, oxybenzone, octocrylene, octinoxate and other compounds commonly used in conventional chemical sunscreens have been found to pose threats to the environment, including killing coral reefs. Retinyl palmitate, a form of Vitamin A, is an antioxidant added to many sunscreens and cosmetics. Sunscreens containing Vitamin A may irritate the skin and increase photosensitivity. There are also concerns about developmental and reproductive toxicity as well as biochemical or cellular level changes. Unlike chemical sunscreen, which uses chemicals to react with the skin to protect against sun damage, barrier sunscreen uses zinc oxide or titanium dioxide to form a physical barrier to block harmful UVA and UVB rays. Physical barrier sunscreens start working the minute they're applied to your skin. Sunscreens made with zinc oxide and titanium dioxide generally score well in EWG's ratings because they provide strong sun protection with few health concerns, they don't break down in the sun, and zinc oxide in particular offers good protection from UVA rays. So how can you ensure that you're protected? Aside from avoiding oxybenzone and retinyl palmitate, check the label to see that the product offers UVA and UVB protection (or "broad spectrum protection"). Be aware that SPF protection does not increase proportionally with an increased SPF number. An SPF of 15 absorbs 93 per cent and an SPF of 30 absorbs 97 per cent. Reapply your sunscreen every two hours and after swimming or sweating, and opt for lotions over sprays, as lotions provide more even coverage. Limit your time in the sun (particularly around noon! ), wear a hat and cover up. It's also important to keep young babies out of the sun -- cover them up and opt for shady spots to sit. Keep kids and children out of the midday sun to prevent burns. 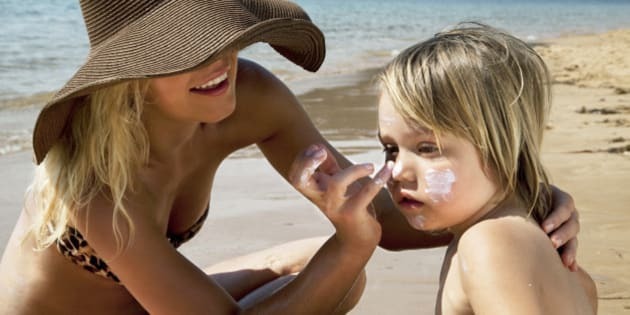 Studies show that people who suffered severe sunburns in childhood are at greater risk of developing skin cancer. The sun does a lot of good -- Vitamin D anyone?? -- so enjoy its rays while being sure to mitigate the risks.